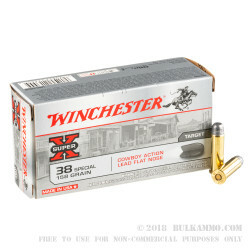 This 38 Special cartridge from Winchester’s Super-X line of ammunition is designed specifically for early American revolvers and rifles, and makes for a fine choice for cowboy action shooting. Winchester bills them as combining the exacting standards of yesteryear with today's advanced technology. This round sports a 158 grain lead flat nose projectile. That bullet’s shape suits it well for use in rifles with tubular magazines, like the classics so often have. Its shape is also great because it will make very easily spotted holes in targets, adding even further value to their use in competitions. 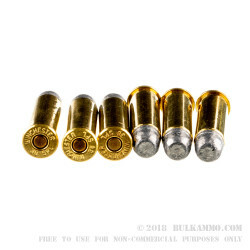 Target shooting is this type of bullet’s primary application. 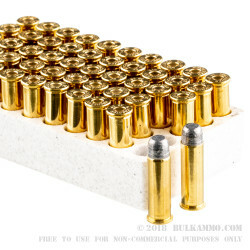 With its non-corrosive Boxer primed brass casing, you’ll be able to make these 50 rounds keep working for you courtesy of your reloading bench. 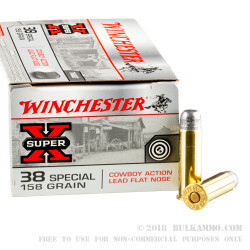 The Super-X line of ammunition has offered excellent value and performance since its introduction in 1922, and it perfectly complements Winchester’s already excellent reputation for quality.